San Diego Movie Theaters listings. Enjoy a night out at one of these movie theaters in San Diego California. Some of these are traditional theatres, and some offer 3-D movies, IMAX movies, luxury or some old fashioned fun. Here is a list of some of the popular movie theaters in the San Diego area. The AMC Plaza Bonita 14 is a standard AMC theatre featuring an IMAX theatre. The AMC Fashion Valley is a standard AMC San Diego movie theatre with smaller than average theatre sizes. Ticket Prices: $10 adults and Seniors, $9 kids. The AMC La Jolla San Diego movie theater is a standard AMC theatre, with NO Stadium seating, so if someone tall sits in front of you, you might have a hard time watching the movie. Ticket Prices: $Ticket prices vary. The AMC Mission Valley is a standard AMC theatre featuring an IMAX theatre. The Cinema Under the Stars is a popular mini outdoor San Diego movie theaters that has anti-gravity seats, blankets, ceiling heaters, and $2 concessions! The Cinepolis Del Mar is one of the best San Diego movie theaters, featuring leather reclining chairs, waiters that come to your seat, and blankets for rent. They also offer some movies that are for guests ages 21+ only. Alcohol may be served. 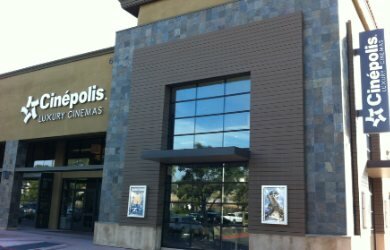 The Cinepolis La Costa is a very nice luxury movie theater in San Diego north county, featuring leather reclining chairs, waiters that come to your seat, and blankets for rent. Have sushi, appetizers, dinner, wine, beer or specialty drinks. Some movies for adults only 21 and up. Reserve your seats in advance online for the best seating. The Digiplex Mission Valley is a standard Digiplex theatre with stadium seating and 3-D films. The Digiplex Poway is a standard Digiplex theatre with stadium seating. The Edwards San Marcos is a large Regal Cinema theatre with stadium seating. This is one of the best San Diego movie theaters in north San Diego county. Buy your discount tickets at Costco and win free popcorn when you use your Regal card. The Edwards Mira Mesa is a standard Regal Cinema movie theaters in San Diego that features an IMAX theater. 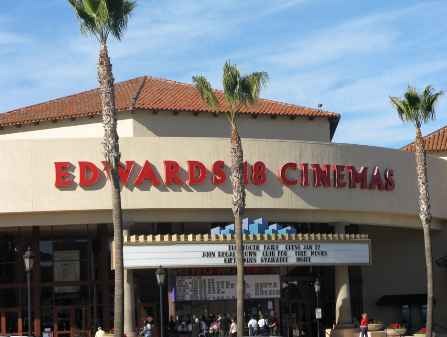 The Edwards Rancho San Diego is one of the standard Regal San Diego movie theaters that has 3d and stadium seating. The Full Moon Drive-In closed in 2013. The Full Moon Drive In was a drive in movie theater that offered the the views a much larger experience than conventional movie theaters offer, by bringing in a tradition from the past combined with the excitement of the modern world. The La Paloma Theatre is a fun old time theater in Encinitas, a beach town north of San Diego. The theater has been around since 1928 and puts on a vivid performance of the Rocky Horror Picture Show every Friday at midnight. The theatre also has live performances, movie film premiers, popular films and classic movies. One of the best interesting San Diego movie theaters for a fun date night. Directions: From I-5 exit Encinitas Boulevard west to the Coast Highway go one block south and they are on the left side. The Landmark Hillcrest is a standard Landmark theater that represents the city’s largest theatre complex dedicated to independent and foreign language films in SD. Impress you date with an interesting independent or foreign film at one of these San Diego movie theaters. The Landmark Ken Cinema opened as the first movie theater to bring quality foreign movies to SD, and is San Diego’s last single screen movie theatre. The Reuben H Fleet Science Center is an interactive science museum for children of all ages that features IMAX movies and Digital Shows. This is the perfect place to go for a whole day or evening of fun in San Diego. Located in San Diego Balboa Park. One of the most interesting experiences for movie theaters in San Diego. Ticket Prices: $15.75 for adults (13 and up). $12.75 for Juniors & Seniors. These prices include admission to the Science Center’s gallery. The Reading Cinemas Carmel Mountain 12 is an old school Reading Cinemas, with no stadium seating and no 3d/IMAX. 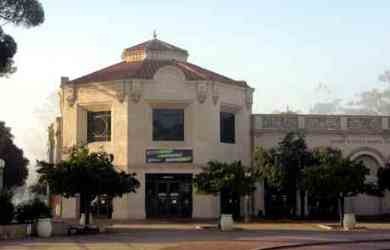 The Reading Cinemas Gaslamp 15 was a standard Reading Cinemas theater with stadium seating and 3D movies. It was located in San Diego Gas Lamp District so it was a good choice for date night after dinner in the Gas Lamp. Sadly, it closed February 1, 2016. The Reading Cinemas Grossmont Center is a standard reading Cinemas theater that includes 3D shows. The Reading Cinemas Town Square 14is a standard Reading Cinemas theater with stadium seating and 3D movies. Another good choice for San Diego movie theaters. The Regal Cinemas Escondido is a standard Regal Cinemas that features an IMAX theatre. The Regal Parkway Plaza 18 is a standard Regal Cinemas that features an IMAX theatre and stadium seating. The Santee Drive-In is a San Diego drive-in movie theater open 7 days a week year round. You gotta love that SD weather. The UA Horton Plaza 14 is a standard Regal movie theaters in San Diego that features 3D movies. The Vintage Village Theatre is a new theater in Coronado that is popular with locals and visitors. Directions: From I-5 take exit 14A to merge onto CA-75 S/San Diego -Coronado Bridge toward Coronado and continue to follow CA-75 S. After taking a slight left onto Third St, turn left onto Orange Ave and destination will be on the right. Ticket Prices: $10.50 for General Admission ($3 more for 3D shows), Seniors and Children are $7.50 ($2 more for 3D Shows). Subscribe to aBeach4U Ezine, our electronic newsletter titled aBeach4U San Diego Beach Lovers, and receive seasonal updates San Diego beaches, attractions and adventures.